One-pot meals are super popular right now, and for good reason. They make meal prep easy and clean up a piece of cake. But it’s easy to assume that these meals aren’t quite as good. 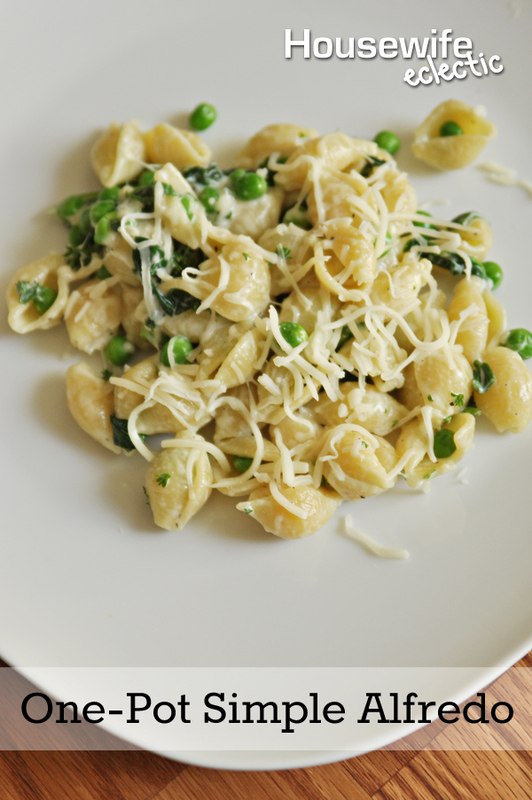 Fortunately, this One-Pot Simple Alfredo keeps things classy and simple. In a large pot, cook the shells according to package directions. Using the same pot (now drained of noodles and water), add cream and spinach over medium-high heat and heat until brought to a boil. Remove from the heat and add in the cheese and peas. Mix well. Top with nutmeg and salt and pepper. It’s really as easy as that. One pot, one strainer, one measuring cup, one knife and one stirring spoon to clean. Plus it will look and taste like you worked all night to prepare it. A win for everyone! Sounds good to me. I don't know if the kids would like it, but my husband would. This sounds like a comforting and filling meal for the bitter winter days. At least it is bitter here in the UK. I haven't made an alfredo dish in a while but I love that this is a one pot meal. I'll have to add it to my meal planning menu. Mmmm, comfort food at its best! I love a good one-pot meal and, yes, they are really popular right now because everyone is pressed for time–we're so busy! Thank you for sharing your recipe! I looove alfredo its so amazing. you had me at ONE pot!!! lol anytime I can do it all in one pan or pot. equals a win in my book! Simple pasta dishes are a staple in our house. Being able to make them in one pot is awesome! This looks so yummy! Perfect for a busy weeknight too! I love alfredo! Thanks for the recipe, looks delicious! I love one pot meals, and this Alfredo meal looks so tasty!!! Alfredo is my son's favorite meal. He would love this and it's so easy to make. Saving the recipe. Now that I am working during the day I need all of the dinner recipes I can find. That looks yummy. I love easy recipes like this. Yum! This look so good and very easy to make! This is one of my favorite things to eat! I love heavy cream and spinach sauces, I put it on almost everything! we love a good alfredo dish so this would be perfect in my house! I cook but I dont do the dishes so this would be perfect for my family!